eD@HoMe: 3 Awesome covers from Slovakia!!! Here, I have 3 awesome covers from Slovakia to share with you. Many thanks to Robert Brnka! 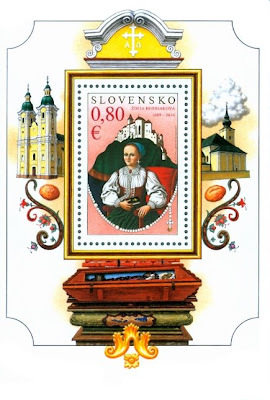 The gorgeous souvenir sheet franked on the first cover was issued on 2nd June 2009 to commemorate the 400th anniversary of the birth of Žofia Bosniaková (1609 - 1644). 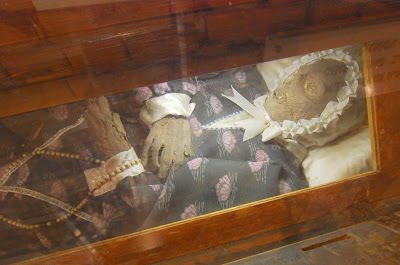 This Slovak noblewoman was famed for the help she gave to the poor and sick, for having founded an asylum for the poor, sick and orphans, and also because her body had been preserved naturally in an excellent, almost mummified, state for 340 years after her death. Until late April 2009, that is, when a mentally ill man set fire to it. A process is currently underway in order to beatify her. 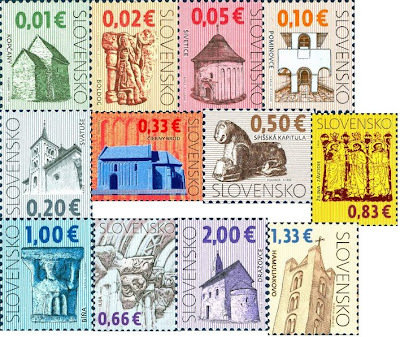 As previously mentioned, the stamp franked on the left belongs to the ""Cultural heritage of Slovakia" definitive series. It was issued on 2nd Jan 2009 as part of basic euro postal stamps. Next, we have this beautiful cover franked with an awesome Astronomy stamp. 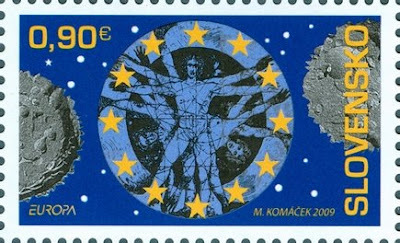 It was issued on 28th May 2009 by Slovak Post to commemorate the International Year of Astronomy. 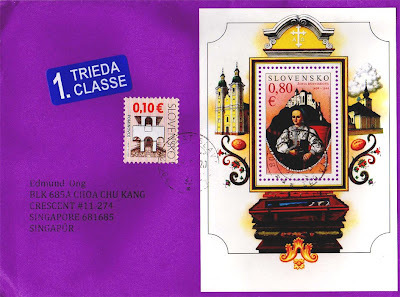 The final cover for today is this gorgeous cover franked with 5 lovely stamps! 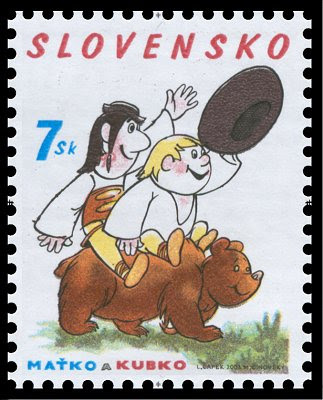 The extreme left stamp depicts "Maťko and Kubko", a classical children's tales written by Marianna Grznárová, about 2 shepherds living in a shepherds cottage and their amusing adventures . 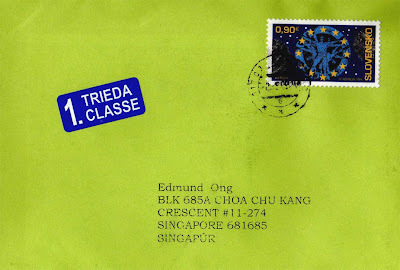 Dedicated to the International Day of Children, this stamp was released on 1st June 2003. 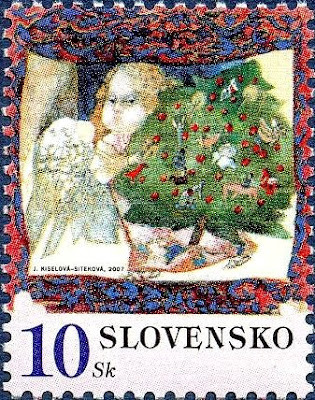 The second stamp from the left belongs to the "Christmas Tree" series, issued on 14th Nov 2007. The Christmas tree is one of the most popular traditions associated with the celebration of Christmas. The custom of erecting a Christmas tree can be traced to 16th century Germany, though neither an inventor nor a single town can be identified as the sole origin for the tradition. 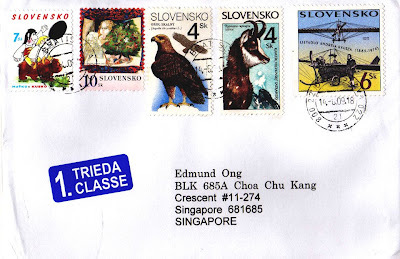 The Eagle stamp franked on this cover belongs to a set of 3 stamps from the "Birds of Prey" series. 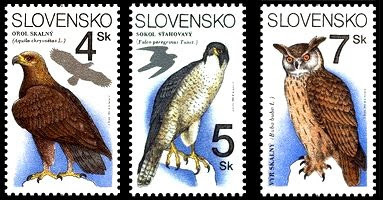 The stamps in this series depict an Eagle, a Falcon and an Eagle-Owl. They were issued on 4th July 1994. Next is a stamp from the "Nature Conservation" series. It shows the endangered Tatra chamois. With a population of just over six hundred, this indigenous Slovakia's fauna is listed in the IUCN Red List of Threatened Species and is protected by law. 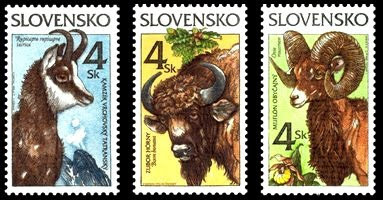 The other two stamps depict the European bison and the mouflon, both are highly endangered. These stamps were issued on 16th July 1996. Last but not least, we have a stamp from the "Technological Monuments" series, issued on 15th October 1996. The 2 lovely stamps in this set depict Andrej Kvasz´s Aeroplane (6sk) and The Bratislava-Trnava Horse-drawn Railway (4sk). Once again, I would like to thanks Robert Brnka for sending these 3 beauties from Trnava, a city in western Slovakia!